Today, ABC airs the final episode of their daytime series, The Chew. Last month, the network announced that the cooking-themed talk show had been cancelled after more than 1,400 episodes. Will you miss it? Was this the right decision? Launching in September 2011, The Chew replaced the All My Children soap opera after its 41 years on the network. A talk show that incorporates cooking and lifestyle-related segments, the series was initially hosted by Mario Batali, Carla Hall, Clinton Kelly, Daphne Oz, and Michael Symon. Oz departed the show after six seasons and Batali left following sexual misconduct allegations in December 2017. ABC decided to cancel The Chew in order to expand their Good Morning America series to three hours. NBC’s Today show has had a third hour (with various titles) since October 2000. The current incarnation is Megyn Kelly Today. While the third hour of Today typically followed the regular program’s two-hour broadcast, hour three of Good Morning America will air separately, in the afternoon. The new hour of GMA is expected to be taped and not presented live, as the regular program is. ABC is making this move as Today has been taking the lead in various demographics in the morning ratings race. If ABC had wanted to expand GMA to three hours, couldn’t they have replaced either The View or Live with Kelley and Ryan? That was unlikely to happen since both perform better in the ratings than The Chew. In particular, The View has been growing its audience and has been seeing its best ratings since the 2014-15 season (a rarity in today’s landscape). Meanwhile, The Chew has been in last place, ranking 13th out of 13 daytime series. While ABC may have high hopes for a third hour of GMA, they no doubt have an uphill battle ahead. Daytime audiences often don’t like change and some viewers still hold a grudge against The Chew for replacing All My Children. Time will tell if the new hour of GMA will fare any better than The Chew did. What do you think? 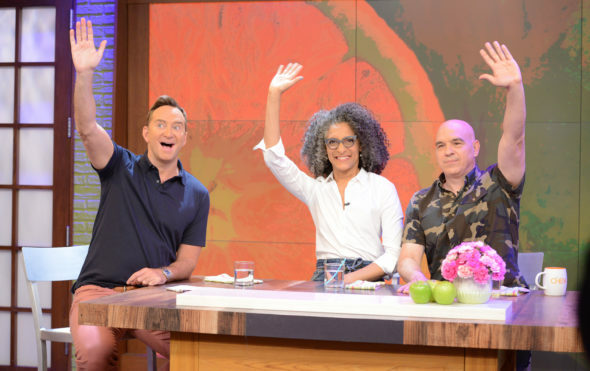 Do you think that ABC should have cancelled The Chew TV series? If not, what could they have done to boost the ratings? Will you check out a third hour of Good Morning America? More about: ABC TV shows: canceled or renewed?, Good Morning America, Good Morning America: canceled or renewed?, The Chew, The Chew: canceled or renewed? I loved this show. It was fun, funny and a good time. Bring them ALL back. Still hoping The Chew will return!